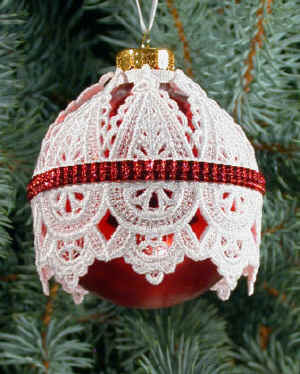 Three sampler packages--each containing designs to fit a different size round ornament: 67mm (2 5/8"), 80mm (3.14") and 100mm (3.94") in diameter. Each size has files to stitch the eight styles shown in 40 wt rayon or 50/60 wt. cotton. Our illustrated instructions in an Adobe Acrobat file will show you how. Add ribbons and trim to suit your fancy. 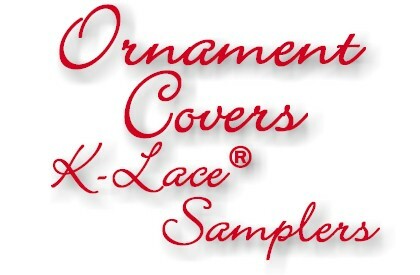 More beautiful K-Lace® by Kae Barron! These collections are available only on CD. Formats included are dst, hus, jef, pcs, pes and sew. Composite files for larger hoops are contained in the dst, jef and pes formats. See the Important Information page for pricing. More ideas for using these designs from Joan Warr. Tips on measuring ornaments: You can measure ornament diameter by putting the ornament snugly between two bookends or upright flat objects and measuring the distance between the flat objects. Slight variations should also work. We have found these sizes locally at Hobby Lobby and in previous years at Michael's.